Contains important orders of Government granting various allowances, promotional benefits and other service benefits to the Postal officials. Contains important circulars of Departments about the latest schemes/services to the public. Contains calculation sheets to work out the arrears of various allowances granted from time to time to the officials. Present Pay including Grade Pay Rs. Illustration 2: If an employee T is presently drawing pay of Rs 24,200 (Rs 20,000 + 4,200) and if the post occupied by T is placed one level higher in GP 4600, then the basic pay should be entered as Rs 24,600 (Rs 20,000 + 4,600) and the pay will be fixed as Rs 64,100 (Example No II in Para 5.1.29). Hence, this example is applicable to Inspector Posts in our Department. Illustration 3: In our Department the GP of IP/ASP/SP has been upgraded to Rs 4600, 4800 and 5400 respectively. Hence as per the Illustration 2 given below Para 5.1.29, the MACP IPs and MACP ASPs are eligible for GP Rs 4800 and Rs 5400 respectively. i.e their new pay level would be 8 and 9. Present monthly basic pension fixed as per 6th Pay Commission Rs. Select the Pay scale from which the pensioner retired. Pensioner 'A' retired at last pay drawn of Rs 79,000 on 30.5.2015 under VI CPC regime, having drawn three increments in the HAG scale 67000-79000. Basic Pension fixed in VI CPC is Rs 39,500. Initial pension to be fixed under VII CPC is Rs 1,01,515 (39,500 X 2.57) This is Option 1. Notional Pay fixation based on 3 increments is Rs. 199100. Hence option 2 would be 50 percent of Rs 199100 i.e Rs 99,550. As option 1 is higher, pension admissible is Rs 1,01,515. Pensioner 'B' retired at last pay drawn of Rs 4,000 on 31.1.1989 under IV CPC regime, having drawn 9 increments in the pay scale of Rs 3000-100-3500-125-450. Basic pension revised in VI CPC is Rs 12,543. Initial pension fixed under VII CPC is Rs 32,236 (Rs 12,543 X 2.57). This is Option 1. Notional Pay fixation based on 9 increments is Rs 88,400. Hence option 2 would be 50% of 88,400 i.e Rs 44,200. As option 2 is higher, pension admissible is Rs 44,200. The Minister of State for Communication and Information Technology Shri Sachin Pilot along with Human Resource Minister Sh. 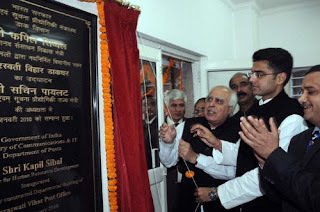 Kapil Sibbal dedicated the newly constructed building of Saraswati Vihar Post office to the people of the area. Speaking on the occasion Sh. Pilot said that India Post is systematically transforming post offices under Project Arrow in order to provide quality service to its clientele. Delhi Postal Circle has been included in phase III of Project Arrow and 36 post offices have been identified for complete implementation of Core Areas and Look and Feel. Presently there are around 2000 SB accounts, 2450 RD accounts 5300 MIS accounts, 800 SCSS accounts, 1800 TDA accounts and 15000 cash certificate holders availing service of this post office. There is average booking of 60 Speed Post Articles, 50 Regd. Articles and collection of 30 DJB/MTNL bills & PLI deposits per day. This Post Office is providing postal service to more than 50000 population of the surrounding area. In near future, the delivery of mails of entire Delhi-34 as well as clearance of 42 letter boxes will be made from this post office with the proposed upgraded establishment having staff over 70. (1SPM (HSG-II), 2 ASPM (LSG), 13 PA, 48 PM, 3 Stg. PM and 9 Group ‘D’ (including letter box peon and chowkidar)). Opened on 1.8.1980 at D-715 Saraswati Vihar Post Office, shifted to ‘C’ Block market on 15th June, 2002. This Post Office was upgraded to into LSG Post Office w.e.f. 2.4.2003. On a plot (391.11 sq.mt. area) purchased in 1997, the construction of present building was completed on 4.12.2009 and fully computerized post office started functioning in its new building w.e.f 5.12.2009. States Cities Classified as "X"
States Cities Classified as "Y"
Remaining cities/towns which are not covered under "X" or "Y" are classified as "Z" for the purpose of HRA. All efforts have been made to ensure accuracy of the content on this blog, the same should not be construed as a statement of law or used for any legal purposes. Postal Staff corner accepts no responsibility in relation to the accuracy, completeness, usefulness or otherwise, of the contents. Users are advised to verify/check any information with the relevant department(s) and/or other source(s), and to obtain any appropriate professional advice before acting on the information provided in the blog. Links to other websites that have been included on this blog are provided for public convenience only. Postal Staff Corner is not responsible for the contents or reliability of linked websites and does not necessarily endorse the view expressed within them. We cannot guarantee the availability of such linked pages at all times. Ex-gratia Gratuity Granted at the rate of half months basic TRCA drawn immediately before discharge of service for each completed year of service subject to a maximum of Rs 18,000 or 16.5 months basic TRCA last drawn whichever is less. Minimum service prescribed is 15 years. Continuance of the existing formula for grant of Ex-gratia Gratuity subject to a Maximum of Rs. 60,000. Severance Amount A Lumpsum severance amount of Rs 30,000/- is paid on discharge provided a GDS has completed 20 years of continuous service. In case of a GDS completing 15 years of service but less than 20 years of continuous service the severance amount paid is Rs 20,000 Severance Amount shall be paid at the rate of Rs 1500 for every completed year of service subject to a Maximum of Rs 60000 with reduction in Minimum eligibility period to 10 years. Links for several online calculations. 2. Excel file updated on 12.10.2009 at 1120 hrs for drawal of arrears of GDS (other than BPMs) appointed before 1.4.2004. (i) In case of places not connected by rail, travel by AC bus for all those entitled to travel by AC II Tier and above by train and by Deluxe/ordinary bus for others is allowed. (ii) In case of road travel between places connected by rail, travel by any means of public transport is allowed provided the total fare does not exceed the train fare by the entitled class. (iii) Henceforth, all mileage points earned by Government employees on tickets purchased for official travel shall be utilized by the concerned department for other official travel by their officers. Any usage of these mileage points purposes of private travel by an officer will attract departmental action. This is to ensure that the benefits out of official travel, which is funded by the Government, should accrue to the Government. (iv) All Government servants are allowed to travel below their entitled class of travel. At prescribed rates of AC Taxi when the journey is actually performed by AC Tqaxi. The rate of washing allowance for Group 'C' and Group 'D' employees from 1.1.2006 is Rs 60/- per month. This will be increased by 25% every time the Dearness Allowance payable on revised pay scales goes up by 50%. This order is effective from 1.9.2008.
leave is granted to look after any of the needs of their wards like examination, sickness etc. can be availed more than one spell. Proforma for maintaining leave account notified. CCL can be availed only if the employee concerned has no EL at credit. Cycle Maintenance Allowance Rs 30 per month provided the GDS travels a distance of 10 Kms per day Rs 60 per month for GDS MD/MC who use their own cycle for discharge of Duty. Present minimum distance conditions of 10 Kms for grant of Cycle maintenance allowance stands withdrawn. Combined duty allowance (CDA) for Branch Postmasters Rs 100 per month for performing delivery or conveyance or both 1. GDS BPM performing delivery or conveyance of duties or both wil be paid Rs 500 per month for each item of work separately. 2. If the BPM is performing delivery of the BO village only, it will be restricted to Rs 250 per month. 3. BPM exchanging Mails at Bus stand or at Railway Stations will be compensated at the rate of Rs 250 p.m. This blog consists latest rules, orders, news pertaining to the officials and the Department of Posts. Calculations available in the blog has been prepared with proper care. However, the author is not responsible for any mistakes occured inadvertently. Readers are requested to refer the original order/calculation for confirmation.